Join Warren, Finley, Melody and Ade as they move into the big wide world. It’s My Move is about the transition from school to adult life. 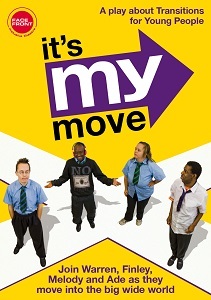 The 90 mins play is suitable for Learning disabled young people from 14 – 21 years. The piece is based on the ‘Forum Theatre’ style, where the audience explore how to make positive outcomes through changing the actions of the characters. It explores the issues for a group of young people with learning disabilities, and includes multiple communication tools including music, movement, poetry, makaton and film. Face Front creates theatre that pioneers social change for an inclusive world. We use the transformational power of theatre to improve emotional well-being and address social injustice. Face Front is led by disabled and non-disabled arts practitioners who make multi-layered theatre that is accessible to all.